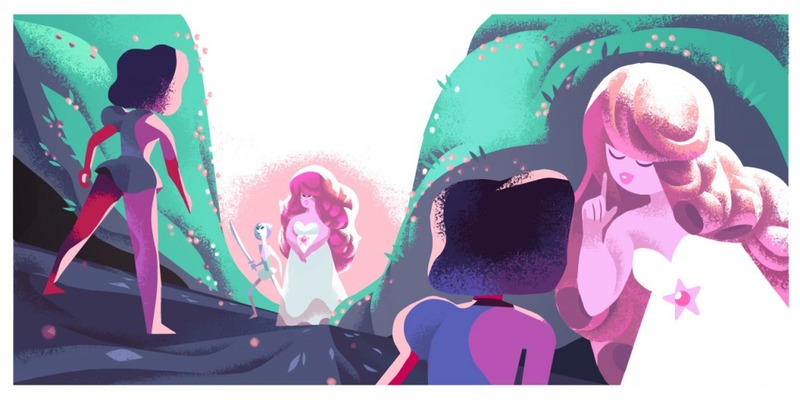 Description: Based in the world of the Cartoon Network show created by Rebecca Sugar, Steven Universe, The Answer follows the two Gems Ruby and Sapphire, after Ruby alters the future and everything Sapphire knew to be true starts to unravel. This books is just so adorable! Ruby and Sapphire are just the cutest little lesbians! And yes Miss Rebecca Sugar, I said lesbians. I know you probably told CN that these rocks ladies were agendered. But let’s be real, they even use the pronouns “she” and they are lesbian space rocks. And I have to say I very interested in whether it was going to be able to be a stand alone book. And I have to say it does hold up pretty well. For children books, you can go simple on language and still get your point across, and they did that here. We know there’s a race called Gems, they have specific jobs to do, and Ruby and Sapphire break out of this mold and are different then the others, and they figure out that they really love each other for that. They changed each others’ perspectives on life, for the better. And that’s all you need to know. Like that episode the romance of Ruby and Sapphire is shown more through their compatibility. From the first time they fuse, they see things in each other and see that their lives can be vastly different from what they thought. And they take that literal and metaphorical leap together. They spend a lot of time on Earth getting to know each other and fall for one another. It’s pretty overt, and The Answer does a lot of showing and not telling. Do you look at your gal pals like that? I don’t think so! Without having to say much, this book deals with ideas of identity, and figuring out who you are. It’s okay to think that the things people think you’re supposed to do, don’t necessarily work for you. It’s okay to be you, even if it makes people uncomfortable. You deserve to be happy too, and you don’t have to explain yourself to people. Kids can put those values to anything, not just sexuality and identity, you can apply that to anyone who is different! It teaches them acceptance and seeing things from other people’s points of view. ALL THAT FROM A LIKE 10 PAGE CHILDREN’S BOOK, WHAT THE —! Ok, I’ll be civil, because this is a kid’s review. The art is unbelievable! The episode that it is based on was like a storybook as well and it was so beautiful. And they take it to a whole new level and really make the images timeless! Steven Universe almost always nails it. The Answer is a quick read, with beautiful images and a great message! I can’t wait to read it to my kids!